Part of Murphy bed and sofa etc. 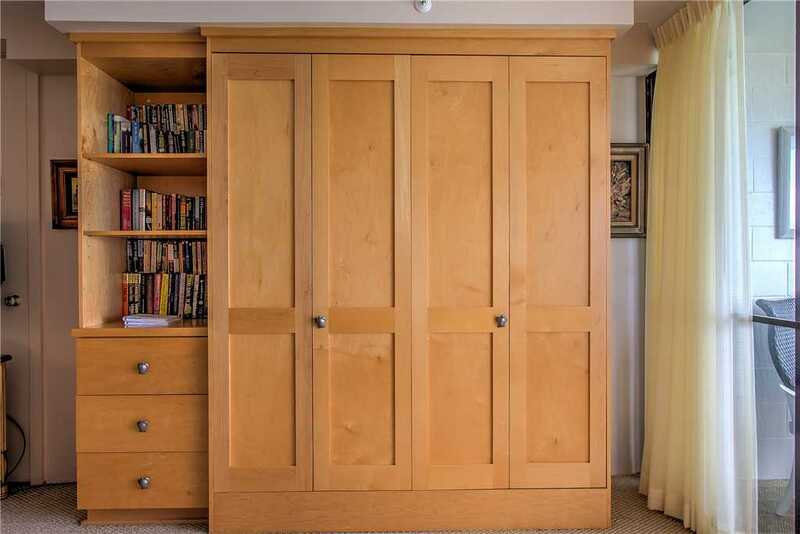 This is a lovely Studio featuring a Queen sized Murphy Bed. The bed is easily placed into the wall to expand your living space if you so desire. One of Maui Kai’s little gems is unit 302. In colorful, floral designs, this room presents itself as a bright, airy part of Maui Kai’s inventory, and makes the visitor’s day a little brighter because of it. The color overtones are reds and greens and the tropical feel is unmistakable.The living room has been extended to include the screened lanai, but the windows may be opened to enjoy the ocean breezes and salt air. Carpeted in beige tones, and the wood-wicker chests of drawers enhance the tropical feel. You will find a comfy sofa for sitting (No sofa bed). The kitchen is done in similar beige overtones, and beautiful marble counter tops. This is a remarkable unit with a relaxing ambiance; inviting you to enjoy your surroundings in the laid back Maui style that the Maui Kai is proud to offer to its guests. Close to shopping and restaurants, and only a ten minute drive from historic Lahaina town, the first capital of the unified Hawaiian Islands, you are located in a quiet nook off the main road which can lend itself to the impression that you are in an isolated spot on the island. The views from 302 are spectacular, the islands of Lanai and Molokai emerging from the ocean in grand fashion and seeming to be close enough to reach out and touch. The sunsets from the beach in front or from the comfort of the air conditioned apartment are spectacular almost without exception and you will remember them for the rest of your life. Join us and let us show you the hospitality of Maui, the Maui Kai, and unit 302. It will be an experience you will never, ever forget. So good to be back in Maui!! 1st time at Maui Kai #302 – the view is spectacular! Loved watching sunsets and reading out on the lanai. Hope to be back soon….. This was our first time in Maui and had a fabulous time doing nothing! The condo was great and had everything we needed. It was wonderful waking up in the morning and sitting out on the lanai, even better having a beverage out there at night watching the sunset and listening to the waves. This condo was excellent! I’m from the UK and it took 26 hours of flight time to arrive. But it was worth this time. It’s clean and all the staff are helpful. Mahalo. Our first visit to Maui! Your condo was awesome! We had everything we needing to cook and relax! Great week of exploring the island. Spent hours at the blow hole one day, and of course, Hana Highway. The condo was super clean and we enjoyed the lanai every morning and night. Here with 12 other people from the wine group of Las Vegas. We had lots of fun. Did the Gazebo Breakfast – well worth the wait, Duke’s also was good. Walked the beach. Swam and relaxed on beach and in the pool. Did the dinner cruise on Alii Nui – Wow! a must try great sunset and food. Also went to Mama’s Fish House – beautiful location great service and superior food. Hit the luau at Feast of Lele. Great show, great food. Yes we also shopped, but mostly a very laid back, restful experience. This unit was very nice even though I battled with the A/C, but finally got it. Thanks. Aloha! My daughter and I had a great vacation. This condo was perfect more than everything we needed. Absolutely love the view. Took the road to Hana tour it was beautiful. Spent a day snorkeling on Trilogy. And went to a luau at the Hyatt-which provided great food on all these events. Didn’t spend a lot of time in the condo, but the time we did was very relaxing. Nice sleeping with lanai open hearing the waves and the fresh air to cool off in the evening. Hope to revisit ASAP.